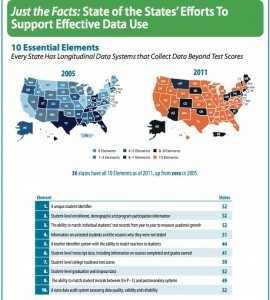 California’s student data system has reached another milestone. By linking the California Longitudinal Pupil Achievement Data System, known as CALPADS, with two other data systems, state education officials tracked for the first time the number of high school graduates who enrolled in college – in and out of state. 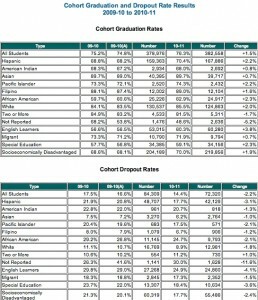 They found that nearly three-quarters of the 382,514* high school graduates in the class of 2009 enrolled in a college or university. More than 25,000 went to the University of California, some 44,000 enrolled in California State University, 109,000 went to a California community college, and the rest attended private colleges either in California or in another state. CALPADS has had a shaky path since it was first approved in 2002. Most recently, Gov. Brown sought to defund the data system over the summer, but wound up keeping the student system and eliminating the teacher data system, CALTIDES. 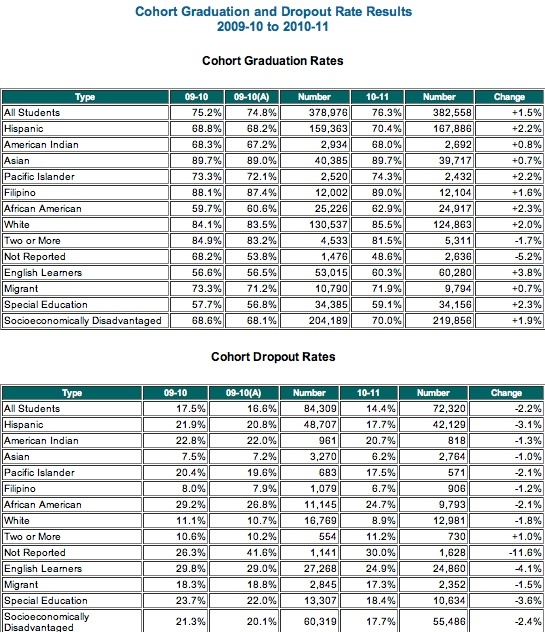 The college enrollment statistics were generated by matching student data from CALPADS with two other data systems: the National Student Clearinghouse and the California Postsecondary Education Commission (which has also been decommissioned by Gov. Brown). the University of California and Cal State are 80.5 percent and just over 47 percent respectively. At the state’s community colleges, even after six years, 70 percent of students planning on earning an Associate’s degree or certificate had not completed the work. Soon, Brown will have to give an inkling of his thinking. The seven school districts that nearly snagged a federal second-round Race to the Top grant on behalf of California are anxious to pursue the next round. The competition will be limited to nine second-round semifinalists, so the districts, operating under the umbrella organization California Office to Reform Education, or CORE would appear to have the inside track to grab $50 million of the $200 million Duncan has set aside. With few dollars anywhere for doing anything innovative, the CORE districts covet the federal dollars to help continue their work implementing the Common Core standards and creating new ways to recruit, train, and evaluate teachers and administrators. The rules for the next round are expected out in the next several weeks, but two requirements are likely: Brown, State Superintendent of Public Instruction Tom Torlakson, and State Board of Education President Michael Kirst will all have to sign off on the CORE application, and the feds will require some use of standardized test data for evaluations. The state’s retreat from CALTIDES by itself may not prevent the districts from moving forward on their own, but it could complicate CORE’s effort. A teacher database, assigning teachers anonymous identifiers, could be quite useful for analyzing which teacher credentialing programs are effective, where teachers are being assigned outside of their specialties, and which teachers are showing good and bad results, based on training, curricula, and other factors. On this question, CTA has an answer: no. I’ve been hearing from several sources that CTA has been lobbying Torlakson, if not Brown, not to let CORE’s Race to the Top application move forward. CTA President Dean Vogel denied this in an email to me, calling my claim “bad information,” but I remain confident in what I’m hearing. Brown is counting on CTA’s deep pockets next November to put a revenue initiative on the ballot. CORE districts are worried that election politics may trump clear benefits of the $50 million grant and the principle of local control. 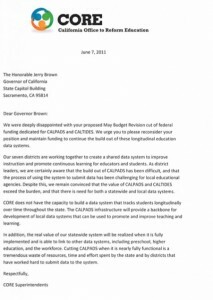 In his veto message, Brown said he was cutting the money for CALTIDES to save “the development of a costly technology program that is not critical.” Brown also wants a commission to answer the bigger questions about student and teacher data, including concerns over privacy: What’s necessary to collect and for whom is the data important? Brown has yet to appoint members of the commission. ** Ashley and other state officials are disputing an Education Week story that indicated that Brown’s veto of CALTIDES jeopardized the state’s commitment in accepting $6 billion in federal stimulus dollars and that the state may be asked to repay all of the money. Ashley said that the state complied with the requirement to assign unique identifiers to teachers, with the capability of linking student test data to teachers. At this point, he said, the federal government is not requiring the actual linkage, just the ability to do it. Duncan has said that future grants and the reauthorization of No Child Left Behind would require using the data. With congressional Democrats and Republicans looking like they’re headed for more gridlock, this time on education, Secretary of Education Arne Duncan confirmed Monday that the Obama administration would permit states to seek waivers from the tightening screws of the No Child Left Behind law. California could certainly benefit from waivers and would prefer its own accountability system as an alternative to the feds’. But it also could have a hard time persuading the feds to grant it a waiver. The details of the waiver requirements won’t be published until next month; Paul Hefner, spokesman for Superintendent of Public Instruction Tom Torlakson, said the state would wait to see them before deciding whether to apply for a wavier. But Duncan and others have indicated that states would have to commit to conditions for reform similar to those required of states seeking money from Race to the Top: using a statewide data system to inform decisions; creating teacher evaluation systems based on multiple criteria, including student test results; taking actions to turn around the lowest performing schools; and adopting career and college readiness standards. California at this point might flunk the first three of the four measures. 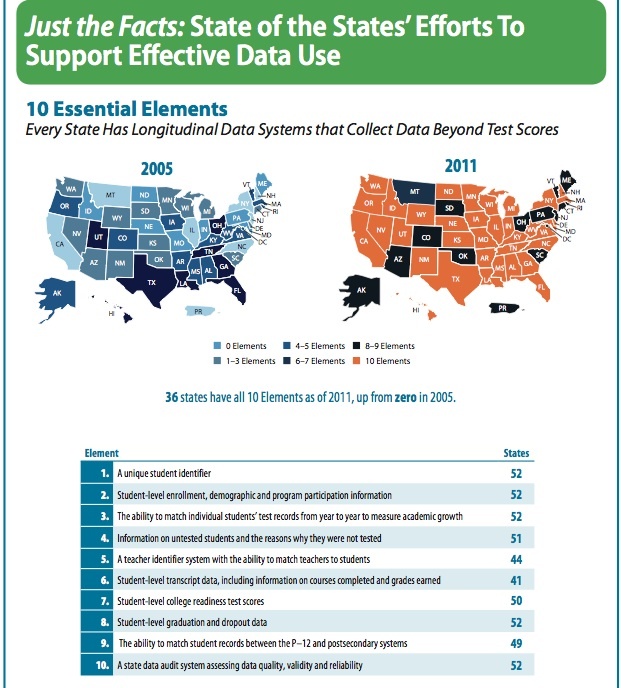 The statewide student data system, CALPADS, remains behind schedule and more limited in scope than other states’ systems. Gov. Jerry Brown mystified Duncan by rejecting $2 million in federal money to build a teacher database, CALTIDES, which would have provided insights into teacher training programs and teacher placements. A bill on teacher evaluations, AB 5, amended to appease the California Teachers Association, may go nowhere this year – and could be interpreted to prohibit using standardized tests to judge teachers’ performance. And the state Department of Education was chastised this spring by the feds for their inadequate monitoring of the lowest performing schools that received more than $133 million last year in federal School Improvement Grant money. Furthermore, years ago officials in the Bush administration for technical reasons rejected California’s request for a waiver to implement a different accountability model, using growth in API scores. California has made no efforts to design a new assessment system to accommodate the feds’ objections. Put all these factors together, and California would face tough odds in persuading the feds to grant a waiver. Exceeding his authority under the law? Duncan’s critics charge him with using waivers to swap the Administration’s concept of education reform for NCLB’s requirements, superseding the intent of Congress. That would appear to be the case. But Duncan is also responding to states’ call for relief from NCLB’s chief provision: the unrealistic demand that all students be proficient in math and English language arts by 2014 – with stiff penalties for schools that fail to comply. Duncan has predicted that 82 percent of schools across America would fail to make NCLB’s targets this year. I and others have doubted that estimate; even in California, with very high academic standards among states, only about half of schools will fail to meet targets because of a “safe harbor provision” that lets many schools improve at a slower rate. Nonetheless, states resent the 100 percent proficiency requirement, and there has been bipartisan resolve to modify or abolish the provision when No Child Left Behind – or the Elementary and Secondary Education Act, as it’s formally known – is reauthorized. Duncan said he could be criticized for “tone deafness” if he ignored states’ pleas. But reauthorization is already years late, and now it’s appearing unlikely that a new version will be passed before the November 2012 elections. That’s why U.S. Rep. George Miller, the veteran East Bay congressman who is the ranking Democrat on the House Education and Workforce Committee, now supports Duncan on waivers, reversing a position he had a few months ago. Then, he agreed with his Republican counterpart, Committee Chairman John Kline of Minnesota, that waivers would distract the Committee from its goal of reauthorization this year. Since then, Kline and Republicans pushed through the Committee a bill that would give states flexibility to spend Title I funds as they want. For Democrats and civil rights groups, that violated a 50-year commitment to improve education for poor children and English learners and was a clear signal that reauthorization was in trouble. Miller is hoping that Duncan does not take a rigid approach to the waivers. He wants Duncan to permit alternatives to turning around the lowest performing schools to only the four models allowed under Race to the Top. And he doesn’t favor the federal government setting the percentage that student test results must comprise a teacher’s evaluation. In a compromise with the Legislature, Gov. Jerry Brown has vetoed money for one of two education databases he wanted to eliminate. Cutting about $2.5 million in federal funds for CALTIDES, a statewide data system that would have compiled information on teacher training, placement, and effectiveness, was among $24 million in cuts that the governor made while signing the state budget on Thursday. 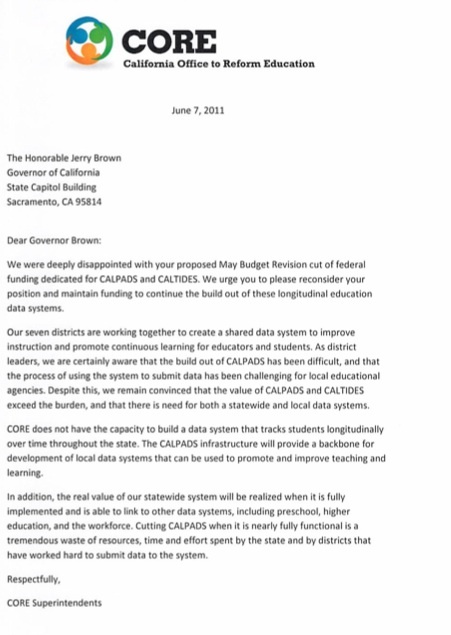 Vetoing the money for CALTIDES, the California Longitudinal Teacher Integrated Data Education System, avoids “the development of a costly technology program that is not critical,” Brown wrote in his veto message. At the same time, he didn’t cut the $3 million for CALPADS, the statewide student database that he had dropped from his May budget revision and that the Legislature had then restored. CALPADS, the California Longitudinal Pupil Achievement Data System, is more important of the two; although it’s been intensely criticized for delays, poor management and implementation, and technical problems, it’s within months of completion, and has been compiling individual student data on enrollment, course completion, attendance, grades, test results and graduation for three years. Eliminating it now would have created headaches for districts, which still would have had to collect some of the data, and denied the state potentially valuable information on what works in the classroom and which students are not being served well – and why. CALTIDES is not yet off the ground. It would be designed to provide insights into the value of teacher preparation and training programs, teacher placements and effectiveness. It could, for example, provide information on the distribution of highly effective teachers in high-poverty schools. Its primary purpose would be to provide research to guide policies, although teachers have been wary of how it could be used to evaluate individual teachers. State Board of Education President Michael Kirst said that Brown has not decided whether to scrap CALTIDES or delay it. Meanwhile, the governor’s office will continue to explore how postsecondary and early childhood data can be integrated with CALPADS, he said.